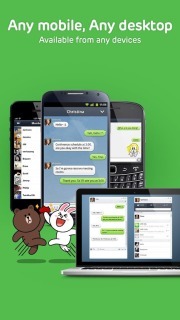 LINE has more than 100 million users worldwide and is used IN over 230 countries! LINE has been ranked no. 1 in the free app category in 41 countries including Japan, Taiwan, Spain, Russia, Hong Kong, Thailand, Singapore, Malaysia, Macau, Switzerland, Saudi Arabia, United Arab Emirates and more! Talk for as much as you want and best of all, it&rsquo;s free! Messages Delivered to you Quick! Instead of taking time to email sms your friends, use LINE&rsquo;s message function to send messages easily with colorful icons, photos and even location information. &middot;Express yourself using stickers and emoji. &middot;Have fun with LINE&rsquo;s &lsquo;Home&rsquo; feature: Share your moments with all your friends using photos, videos, and location info. &middot;Use &lsquo;Timeline&rsquo; to see what your friends have been up to and what they have posted! Leave comments, messages and enjoy your communication. New Sticker Shop! Find all your favorite characters here!